At two congressional briefings celebrating the 23rd anniversary of the Americans with Disabilities Act (ADA) on July 29, the Judge David L. Bazelon Center for Mental Health Law unveiled a set of consensus principles reflecting the disability community’s shared vision of community integration. The document, entitled Community Integration for People with Disabilities: Key Principles (PDF), lays out a vision in which people with disabilities are afforded opportunities to live in their own homes, work in regular, non-segregated employment, and make their own choices. 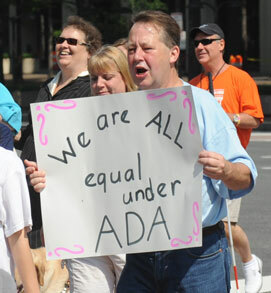 The U.S. Senate Health, Education, Labor, and Pensions Committee highlighted the Key Principles in its recent report, Separate and Unequal, detailing how state service systems continue to serve many thousands of people with disabilities in needlessly segregated settings, despite the ADA’s requirement that states administer services to people with disabilities in the most integrated setting appropriate. Embracing the key principles are 26 major national organizations, including the National Council on Independent Living, representing people with disabilities, family members, service providers, and state administrators. Burnim was one of seven speakers at the events, which featured officials from the U.S. Department of Justice and the U.S. Equal Employment Opportunity Commission, a member of the National Council on Disability, a former resident of a nursing home, and other experts.